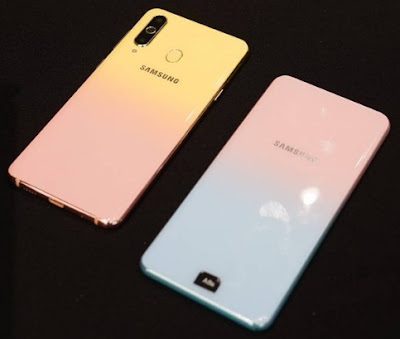 Samsung will launch Galaxy A8s FE (Female Edition) on February 14, 2019 / Valentine's Day. Hope it will be a glad news for some. And, the phone parted a gender as well. The mobile phone will come on gold gradie and a pink colors. The phone might come with upgraded version to Samsung Galaxy A8s cell phone. The phone would also come with a hole punch camera which would help during gameplay and screen display etc. by keeping its camera location aside. The brand has earlier released Galaxy A8s, Galaxy A9 and A7 smartphones etc. Also, Samsung is expected to launch Galaxy S10, S10 Plus, S10 Lite smartphones and Galaxy M10, M20 and Galaxy M30 smartphones series anytime soon. If you are looking for more detail on Samsung Galaxy A8s FE phone's price, colors, features, technical specifications, review, first impression and unboxing etc. then you could find some of them over here very soon. You will also know when Galaxy A8s phone will be released and what would be the prices of Samsung Galaxy A8s mobile phone etc. soon.